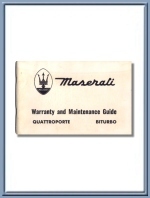 1985 USA Maserati Quattroporte & Biturbo Warranty & Maintenance Guide Booklet. 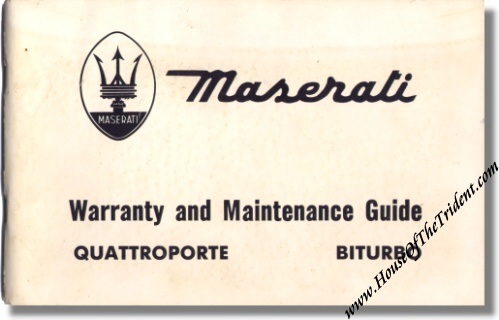 This is a 1985 "Warranty & maintenance Guide" for both the Maserati Quattroporte and BiTurbo, North American versions. It was issued by the US importers on behalf of the Maserati Factory. It carries an addendum which has been stapled to the back cover regarding the 24 months / unlimited mileage warranty. 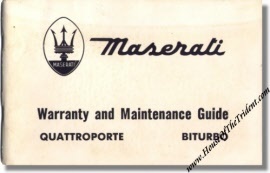 It was filled our for Maserati Quattroporte S/N 305240 on May 10, 1985 by Wide World of Cars in New Jersey. None of the coupons have been used or filled out.